Central Asia being crucially located in the wider matrix of Eurasia can play an effective anchor for powers like India, Russia and China towards bringing peace and stability in Afghanistan. Putting in context the words of Karimov, the countries of Eurasia have suffered and are suffering religious extremism and terrorism in various magnitudes. Both the leaders during their meeting in Moscow last week agreed that post-2014 Afghanistan will be more volatile with extremism and terrorism proliferating more intensely into surrounding regions. Uzbekistan is a neighbour to Afghanistan, as are the Central Asian countries of Turkmenistan and Tajikistan. During his ongoing visit to Dushanbe, Indian Vice President, Hamid Ansari echoed the sentiment of Karimov that the countries of Eurasia must get their acts together to counter extremism and terrorism. Besides these menaces, as the United Nations Office of Drugs and Crime in its recent report on Afghanistan suggests that the country in recent years has witnessed faster growth in opium production. Other regional powers like India and China, along with Russia, would also be interested to have common approach to the Afghanistan issue. India and Russia have already a joint working group on Afghanistan since 2000, and both the countries have insisted on a regional format to address the complex issue. Both the countries have opposed any violent resolution of the conflict in the war-torn country and have called for a peaceful resolution through dialogue and deliberation. Similarly, the counterterrorism meeting in Beijing between India and China last week emphasised on regional cooperation to address the Afghanistan issue. The Chinese foreign ministry official pointed out, “The countries believe the situation in Afghanistan is closely connected to regional peace and security.” It needs mention that early this year India, Russia and China had deliberations on Afghanistan in Moscow. Uzbekistan in February and March arrested members from banned organizations Islamic Movement of Uzbekistan and Hizb ut-Tahrir, and seized extremist literature and CDs, meant for distribution in Fergana oblast. 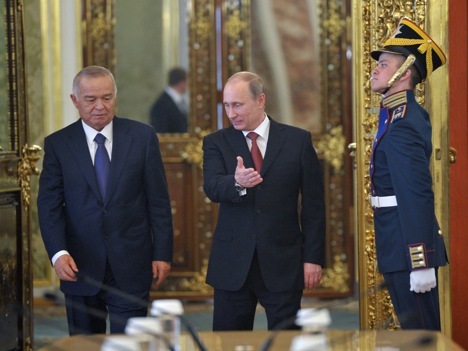 Uzbekistan under Karimov is wary of the extremist forces, which have recently stepped up activities in a surreptitious manner. The country has stepped up public awareness campaign against the extremist forces. For instance, the Committee of Women of Uzbekistan plays an active role to dissuade women from the trap of extremist forces. The situation in other countries of Eurasia is equally appalling. One of the major sources of income for the Taliban and their affiliates in Afghanistan is drug trafficking. The United Nations Office on Drugs and Crime in its report released on April 15 pointed out the increasing acreage of poppy cultivation in the country, particularly in the southern parts, which are under the Taliban influence. The withdrawal of International Security Assistance Force from provinces like Kandahar and Helmand has witnessed the growth of poppy cultivation. The report estimates that the country would likely surpass its highest acreage record of 2008. Last year, the country accounted for 75 percent of world’s heroine supply. It may increase up to 90 percent by this year end. Such a prospect, as some analysts apprehend, would turn the warn-torn state into a ‘narco-state’ with drug being one of the major source of income for the state. If the Taliban returns to power, which is difficult to predict at present but cannot be ruled out, the narco-state and religious dogmatism would provide a lethal combination with negative implications for the countries of Eurasia and beyond. The irony is that despite repeated prodding, the Taliban has never declared that it would espouse path of peace and shun path of violence. Hence, the emergence of the Taliban, the rise of extremism and drug trafficking are problems of gigantic proportions which demand coordinated effort of the countries of Eurasia. Central Asia being crucially located in the wider matrix of Eurasia can play an effective anchor for powers like India, Russia and China towards bringing peace and stability in Afghanistan. Perhaps this volatile situation will foster coordination among the members of the strategic triangle RIC, which will further bring into its ambit the countries of Central Asia to craft peace in Afghanistan through peaceful means.